My sailboats shift and throttle handles are in pretty bad shape. Having been exposed to the elements over the last 30 years of this old boats life, the paint on the levers have started to chip and peel off. Since I was rebuilding my cockpit anyways I decided to order a set of shiny stainless steel shift and throttle levers from Edson. What I didn’t realize was that I wouldn’t be able to just unscrew the old lever and bolt on the new one. At some point Edson decided to increase the screw size where the handle attaches. What I would have to do is drill a larger whole overtop the existing screw hole and then tap it to give it a larger thread. This meant I would have to research what thread the new handle used, buy a drill/tap set, and purchase a strong drill bit capable of drilling through metal. 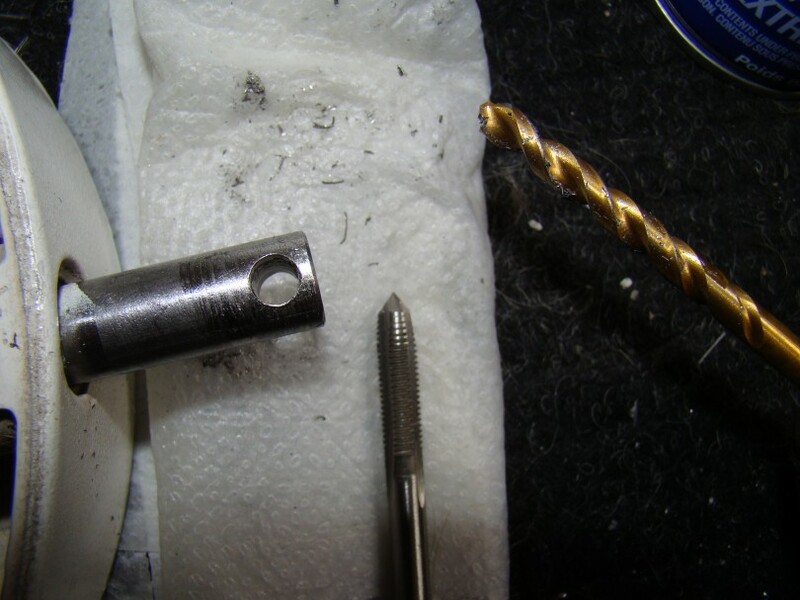 I used a very slow speed to prevent both the drill bit from overheating as well as the metal I was cutting into. 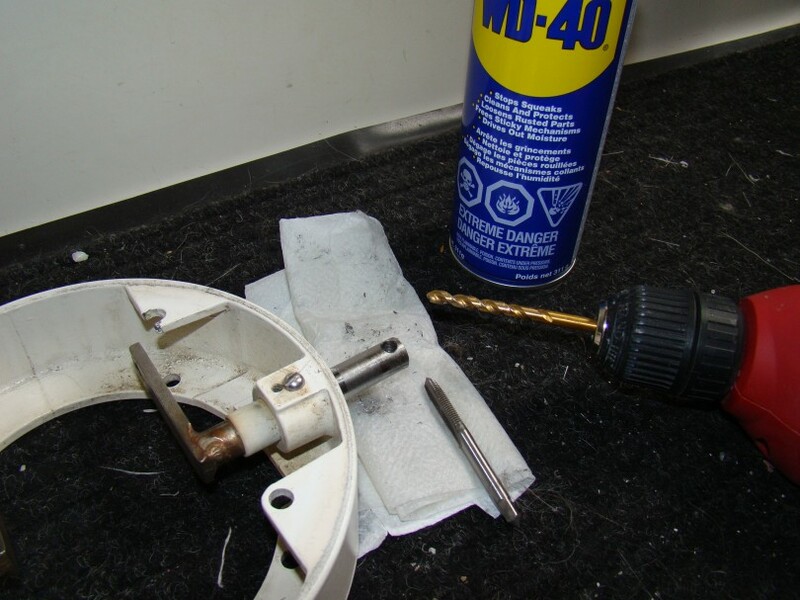 It helped to stop often and cool the area down with WD-40 as well. I would have preferred to have used a proper drilling lubricant but WD-40 was all I had in my tool kit. So after running off to Canadian Tire, I eventually had everything I needed to enlarge the hole. Closeup of the throttle lever base after drilling and tapping a larger hole. I should mention that to do something like this, its best to remove the old throttle assembly entirely from the pedestal. 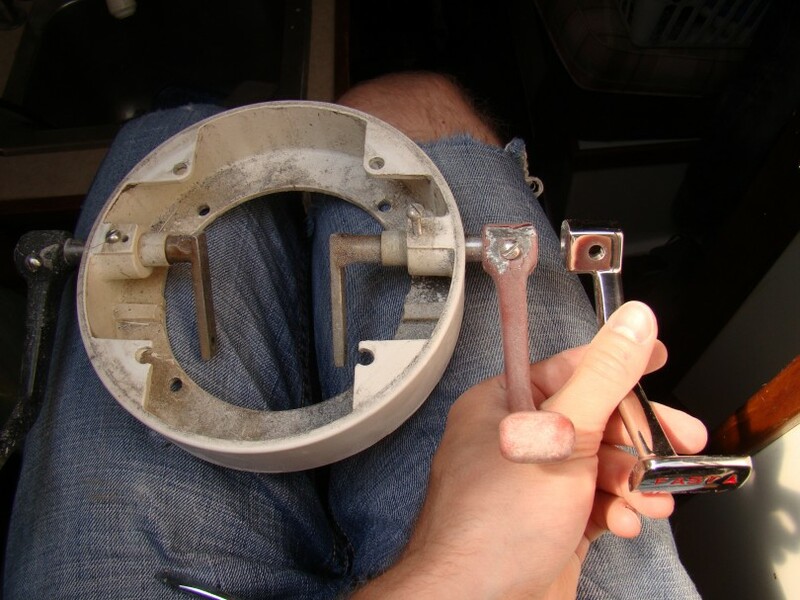 This means removing the compass, the compass riser and unlinking the throttle and shift cable. The only challenge is removing the tiny clevis pin where the throttle cable attaches to the lever. I placed a rag into the pedestal to catch any small falling pieces and I am glad I did. I was already in the middle of disassembling the entire pedestal for my wet deck core project so I would eventually have gotten the small parts out.